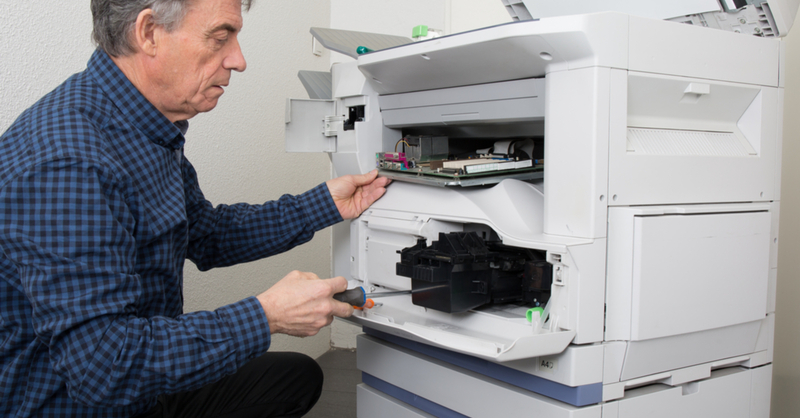 Although printers and copiers are traditional, familiar aspects of an everyday business environment, that doesn’t mean everyone knows how to repair them properly. Sometimes you just need a little help from the experts–but how do you know when it’s time to call in backup? Here are a few tips to make the decision easier. Both printers and copiers are designed to be long-lasting, hardworking machines that never leave you in a bind. However, that doesn’t mean they will always be able to function perfectly. A few problems will eventually come up here and there–and that doesn’t have to spell tragedy, as long as you know what to do about it. The good news is that, when it comes to printers and copiers of every shape and size, there are a few common signs that it’s time to call in the professionals for an expert repair job. Sign #1: Your machine is literally asking for help. Most printers and copiers have a display screen that helps you get all your work done. When this screen shows a “call for service” indicator, you know your machine needs help from the experts. These issues generally tend to be on the more serious side, so don’t risk it. Sign #2: Your print and copy quality is going down. If you notice that your documents are starting to suffer from anything unusual–whether it’s streaks, blots, missing letters, or completely blank pages–it’s time to contact repair professionals. Little signs like these can point to a bigger problem with your machine. Sign #3: You wait much longer than usual. Sometimes, machines will start to slow down for no apparent reason. If you find yourself waiting any more than two minutes for the machine to boot up or do its job, you might want to consider finding an expert in printer and copier repair. Want more tips and tricks for taking care of your printers, copiers, and other machines? Contact us today!